Since Avon Products used to be a bit of a DG investor darling with 22 consecutive years of rising dividends, I figured we should take a look at some of their operating results to see what could have tipped us off that a dividend cut was looming. Let's get into the numbers. Take a look at the red columns on the following chart. They represent the earnings per share. 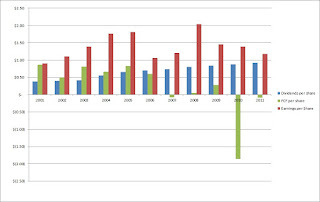 The EPS for the company offered decent growth between 2001 and FY 2005, however the FY 2006 saw a 41% drop in earnings. Considering this drop is just based off earnings per share numbers, this is pretty disheartening. There were 8.7% less shares outstanding at the end of FY 2006 than from the end of FY 2001 so the drop is even larger than the 41% mentioned. Maybe it was a one time issue, since the EPS increased over the next 2 fiscal years. Well, that was all good until the recession in late 2008/early 2009 came along to destroy the growth they had over the past 2 years. Since then earnings have been on a decline with each year bringing less to the bottom line. If you notice the green columns, those are the FCF per share numbers. Everything was okay until 2006 closed and FCF no longer outpaced the dividends paid out. This meant that in order to pay the dividend management had to either start selling shares or take on debt to finance the payment. Management decided to take on more debt in order to cover the shortfall, and since they were already taking some also chose to continue their share buyback program. I could understand taking on a little bit of debt in order to payout the full dividend if you're pretty sure this is a one time issue that won't cause problems going forward. However taking on the extra debt to continue the share buyback program confuses me. Starting in FY 2008 the share buyback program was essentially stalled, although without checking further I'm sure management continued buying back enough shares to counter those received in options to give the appearance that the shares outstanding weren't increasing. Unfortunately the bleeding in their operating results didn't stop along with the share buyback. EPS and FCF per share continued their decline while management continued to take on more debt to pay the increasing dividend. This only compounded the issue. 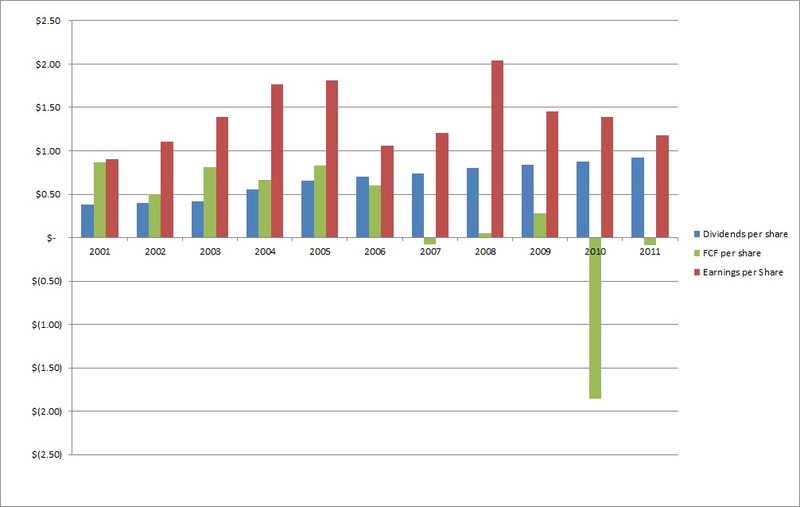 EPS grew 31% from 2001 through 2001 and the DPS grew by 142%. This alone gives reason to doubt the sustainability of their dividend since the payout ratio increased from 42% in 2001 up to 78% in 2011. The gap between FCF per share and DPS grew forcing management to continue taking on more debt. 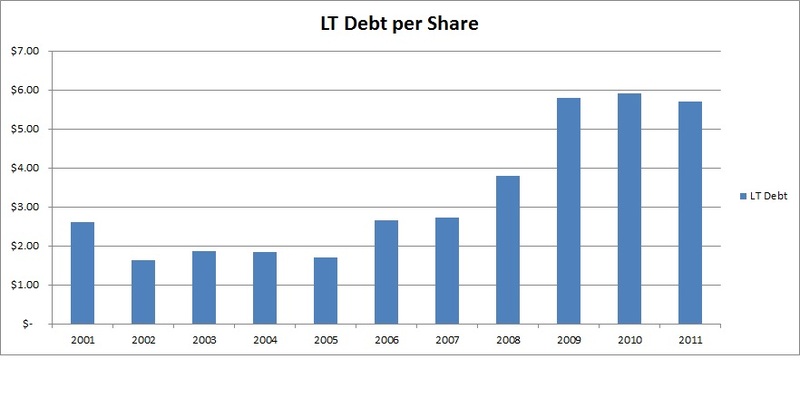 The LT debt per share increased 119% over that same time frame. 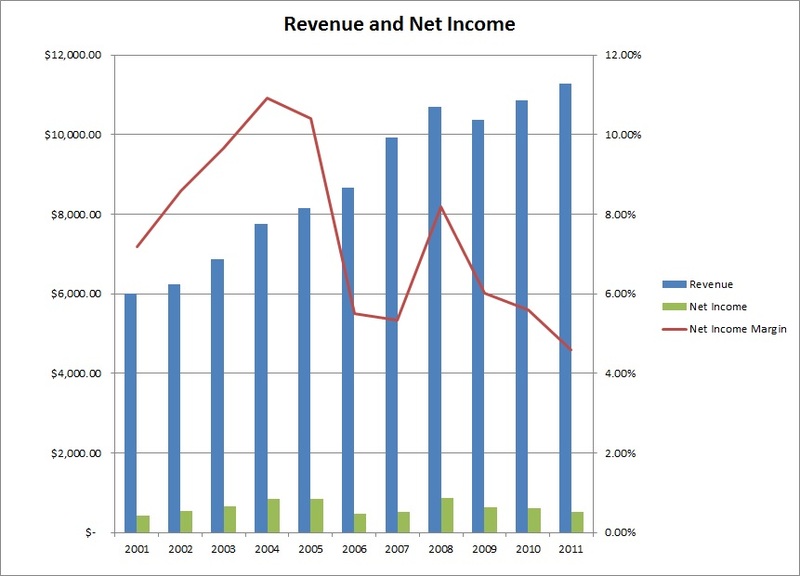 Revenue continued to increase most years since 2001, however their net income declined, due to the increased debt. 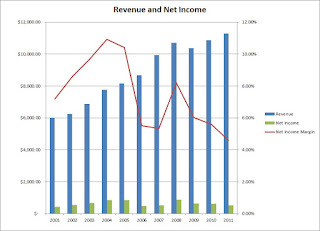 This led to a decline in their net income margin from a high of 10.92% to a low of 4.19% for FY 2011. It's easy to go back and study just how the operating results declined for a company that winds up cutting their dividend but much harder to see in real-time. This is why at the bare minimum a quarterly checkup for all your holdings is required. And I would recommend if you're unsure about the results of a stock you should be checking at least on a weekly basis. If you wait for the dividend cut to be announced you've missed the boat because warnings signs are there in the operating results for a company. An increase in debt to pay out a dividend doesn't make sense. If you pay attention to the signs you could have gotten out much earlier in the decline and put that capital to work in another company. It's not the amount of dividend growth that is truly important, it's the quality of the business and their operations that determines the future dividend growth. That was a very nice article and I really enjoyed the graphs. This gave me a a few additional things that I need to start thinking about and looking at as I evaluate and re-evaluate stocks. Glad to help. It's very important to look at more than just the dividend growth of a company and really get into the operating results of a company. As you can see the dividend growth was still there despite the decline of the company. The writing was on the wall that unless a big change was made there would be a dividend cut. It's the quality of the company that is the most important factor while investing in dividend growth companies. PIP - as the old saying saying goes "You are a day late and a dollar short." Sorry about that. I was just barely getting into DGI at that time. As long as you can take the dividend cut and learn from it then you'll be better in the long run. I think this just goes to show how important it is to keep up to date on the companies that you're invested in. I know I struggle with that at times. Although even if I had been following it in real-time it would have been hard to make that call. It all comes down to how comfortable you are in your knowledge of the company. In retrospect, I think what really sold me on the dividend cut possibility is that the debt was increasing while the operations were declining. Taking on additional debt just compounds the problem. If they would have either slowed the dividend growth or kept it at earlier levels the cut might not have been necessary. Now I need to go check some of my holdings, because there's a few that I'm not too excited about right now. Thanks for stopping by! And I'll pass along information earlier in the process should I come across another potential dividend cut in the making. Very nice analysis, thanks. It's pretty clear the dividend streak was of utmost importance to Avon if they kept borrowing to increase it. Seems like the intentions were good, but the business just couldn't support it. It's not always true, but I've noticed that when yield is high something is usually going on. It doesn't apply to certain types of stock built for high yield (MLPs, REITs) and certain industries such as tobacco and telecoms. Then again, TEF had a yield over 10% before it was eliminated. Same with FTR before the cut if I'm not mistaken. It might be best to take a cue from Mr. Market and avoid stocks(or atleast do extra research) if the yield seems out of whack within the industry. Just an observation. Thanks again for sharing discoveries on an important topic. The road to hell is paved with good intentions, right? It's not quite that extreme, but the health of the company is now at risk due to the increased debt load. They should be fine but will need time to get back on the right track. A yield that is much higher than it's counterparts is at least a sign that you should look more into the reason why. I just hope that if/when I see this happening with one of my positions in real-time I don't forget the risks that are present. Nice analysis -- it highlights the importance of going beyond earnings and looking at free cash flow. Once you start seeing zero or negative FCF then I think a dividend cut becomes more likely. It's very important to look beyond just the earnings and dividends when determining whether a company is safe to invest in. This goes hand in hand with your decision to sell ADM not that long ago. I think I'm probably going to be joining you in getting out of that position because the risks are there and the DG isn't extremely spectacular. I might come to regret it later because long-term I think they'll be okay, but it's the short-term that has me worried. I think, taking debt to pay out dividend is a very bad idea and definitely unsustainable approach. If I see a company doing it, I do not care how temporary the measure would be, I will at 98 per cent sell the company and invest in another. Thanks for sharing this analysis. It is great to realize and reinforce another important aspect in watching and managing your holdings. Extra debt to pay a dividend is a no-no for me. That's one reason why I really didn't like Costco's special dividend. If they were paying it out from cash on hand that'd be fine, but taking on $7 per share in debt just to pay a special dividend didn't make sense to me. It really is important to continuously check up on companies that you own. Some more often than others though. I'm just glad that I got to look back at a company that I didn't happen to own and go through the dividend cut. It's very important to check up on any investments you have to see if they still fit in your overall scheme. There's always warning signs for a failing company, but sometimes you have to work harder to find them. It was pretty interesting looking back and seeing what went wrong and it gave me one other thing to be conscious of when analyzing companies. I totally agree. I am always surprised at how many people take these 25 year dividend increase lists as a buy portfolio. A list from 2007 will show that a fair number of these companies cut in the next 2 years, despite the historical track record. I need to see evidence the business model is currently working. I would say that the long streak of increases is a good place to start but it's not the be all and end all to the research you need to make. Companies hit rough patches all the time and are forced to change their modus operandi. That's why I try to do as much research as I can to keep up to date on current and potential holdings.